Small, not-too-ripe, pear and peach, 3 each – all peeled, cored, and sliced. 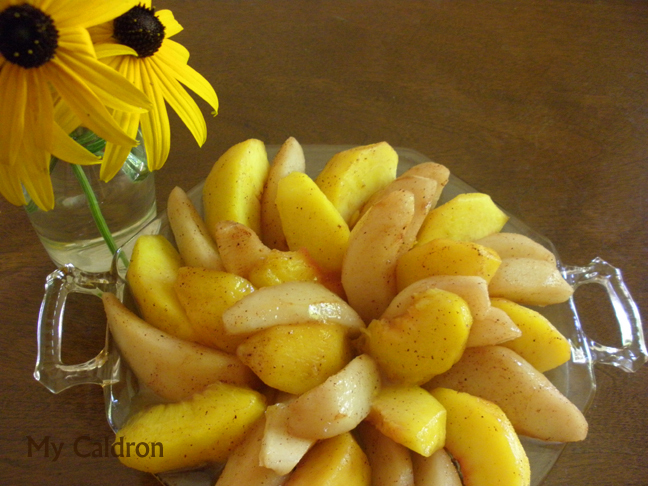 Method: Mix honey and lime juice and toss pears and peaches with the mix in a bowl. Place butter in an oven-safe dish and preheat it in oven for five minutes. Now, transfer the fruit slices to the oven-safe dish; sprinkle cinnamon between layers. Cover the lid and cook at low temperature (250 F) for about an hour. half way through baking, take the dish out and give it a good shake. Let it cool a bit before arranging the slices in a serving platter. Top it with the produced juice. It will taste, smell and feel tender and wonderful!